Supplementary material reads: "Gershon. City Desk. Illus. Lone Sailor. 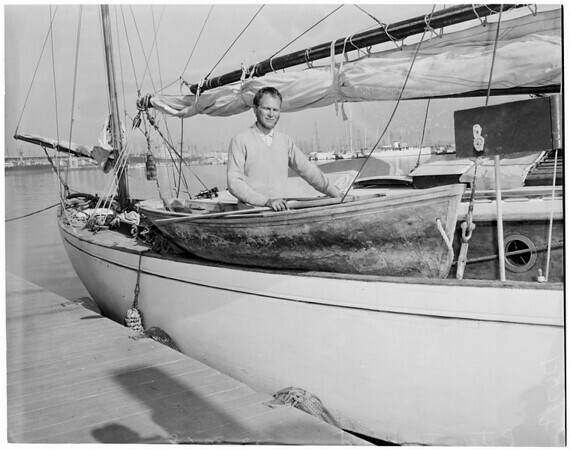 Peter Tangvald, 34, shown seated in Panama native dugout he bought to replace dinghy he carried as lifeboat on board 45-foot yawl Windflower. He is also shown in Sextant only navigational instrument other than wrist watch he has on six thousand mile sea voyage alone in Windflower. He arrived here yesterday after year-and-half voyage from England and is shown at Henry's Landing, Terminal Island, Los Angeles harbor".